As a parent, you may have used IKEA’s handy children’s play area. You drop off the kids, and in exchange you get a buzzer to carry around. After 30 minutes, time is up and you need to collect your children. IKEA does this to enhance your shopping experience. You get a small break to do some shopping without the kids, and they get to play in a supervised environment. So ladies, would you like to do the same thing with your husbands and boyfriends? 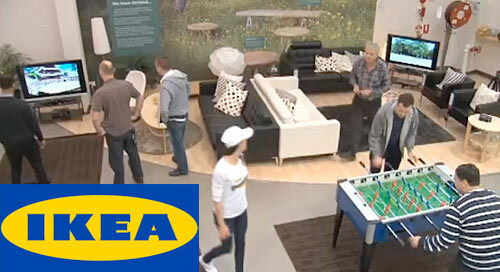 IKEA tested a “MÄNLAND” area where wives and girlfriends can leave their (complaining) husbands and boyfriends to “play” for 30 minutes. Everyone needs a break, right? So… would you like to leave your significant other in the play area, or would you like to be left in the play area while your significant other does some shopping on their own?